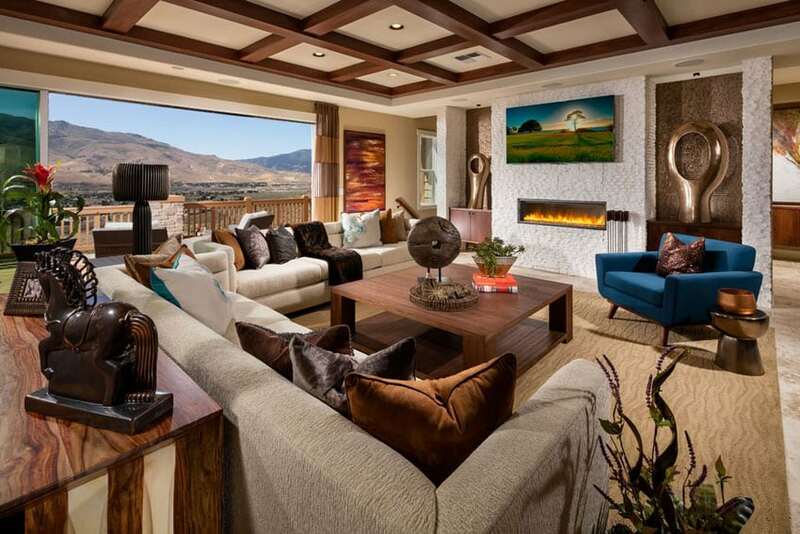 This gallery showcases beautiful living rooms from a variety of design styles. What makes the perfect living room space differs for everyone. However some of the most important features of a beautiful luxury living room include high end furnishings, amazing views, open plan layout, custom finishes, high ceilings, exposed beams, decorative fireplaces and hardwood or natural stone flooring. Below are some of the best living room ideas we could find from top interior designers and home owners. The ocean views of the contemporary design living room shown in the picture above are absolutely priceless. The sliding glass doors are perfect to showcase this vista and also serves as a smart way to let in some additional light. The wood flooring and wooden beam ceiling, both a warm shade of brown that contrasts the whiteness of the L-shaped sectional couch and the painted walls and ceilings, add a certain charm to the space. Designing a living room is not difficult, but most people focus too much on the big items – the living room triumvirate of the sofa, the coffee table, and room lighting – that a lot of the other “lesser details” become but a passing thought. In truth, these “lesser details” are a tremendously large part of what defines a living space. As the saying goes, the devil is in the details. Here are a few lesser known living room decor ideas you might need to consider for a stylish and comfortable living space for your home. 1. The Accent Chair – Sofas aren’t the only seating furniture that makes or breaks a living room space. Accent chairs in the form of arm chairs and lounge chairs are important to the overall look of the space. Make sure it either matches or contrasts the sofa well, along with the other design elements around it. And finally, make sure it is bold enough and stylish enough to qualify as an “accent” piece. Remember, more than just being a place to sit, accent chairs also serve as good enhancers of room aesthetic. 2. Care about the Cushions – Throw pillows are probably further down the list of design elements most people prioritize, but you can’t deny that they add that extra touch of flavor to the couch and ultimately, to the living room. Find ones that add pops of color to the space and match the style of your chosen couch. The key is finding throw cushions that serve to spice up the vibe of the living room. 3. Yes, There’s the Rug – The key to good music is a subtle and yet powerfully present bass line. And seeing as architecture and interior design are just frozen music, that concept also applies with the subtle yet undeniably influential presence of the area rug. A good rug is paramount to any good living room design. It adds character, a pop or pattern and color, and some good texture to the look of the space. In many cases, it also serves as the subtle focal point of the space. 4. Hanging Artwork – Naked walls can be a good choice at times, but more often than not, adorning your interior partitions with paintings and art is rarely a bad idea. And at times, bare walls just seem unfinished in some ways. You’re not limited to just paintings, either. They could be family photos, accent pieces, and sometimes even sculptures. And you don’t have to worry about filling up your wall right away, either. There’s nothing wrong with building up a collection over time – eventually, it’ll serve as a nice personal timeline of the years you’ve spent in the home. 5. Books and Beyond – Books need not be just for reading. Literature such as coffee table books are best displayed on living room furniture such as, well, coffee tables. Lining up any living room bookcases or shelves with your family collection of books can also really enhance the room itself. Of course, you won’t be expected to fill the entire shelf space of your living room with books. For the empty spaces, you could opt to also put select mantle pieces and ornamental items. In addition to any hung artwork, these types of subtle decorations add lots of personality to your living room. 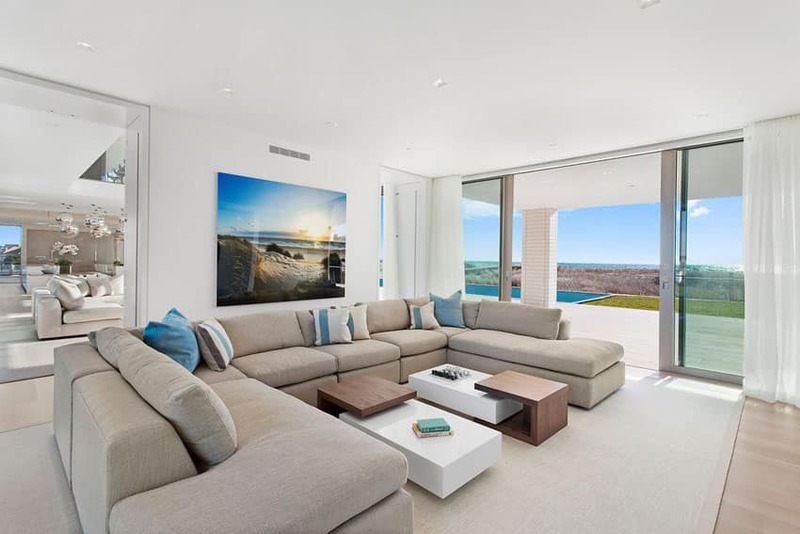 The blue tinge of the ocean views in this contemporary living room is matched by the stylish minimalist portraits hung on one wall and the flat screen television hung on the opposite wall. The circular chandelier is a unique and eye-catching touch that gives the room some amount of flare. The clean look of the utilized furniture keeps the room feeling nice and homey. 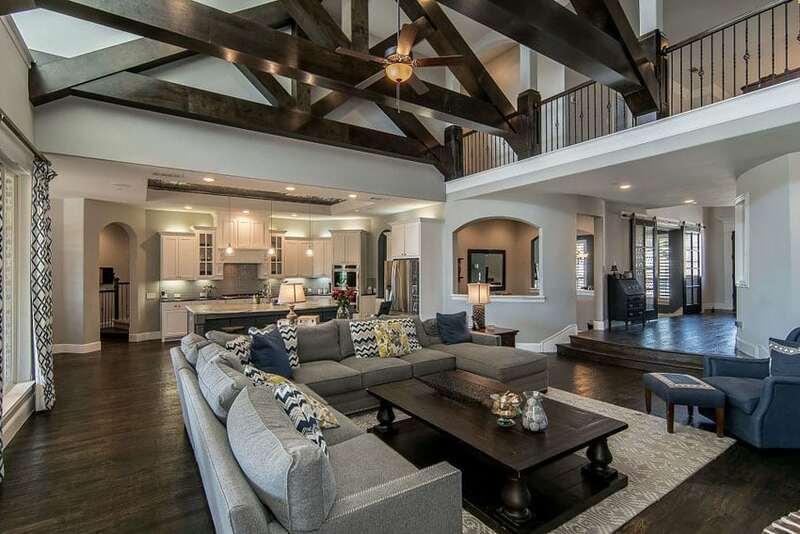 This luxury living room with a comfortingly inviting large sectional sofa uses wood floor, wood board ceilings, and exposed beams – all stained with the same rich wood varnish – to make this space warm and welcoming. The built-in bookcase and display shelves with the stylish white fireplace in the middle. 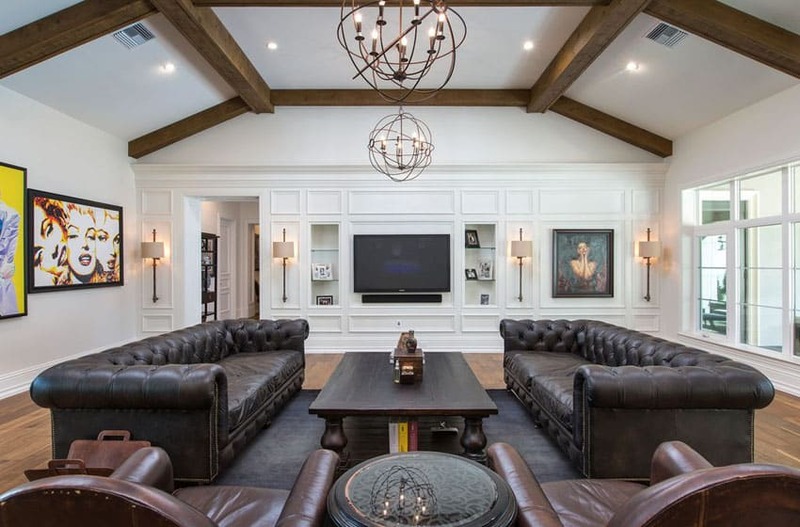 The vaulted ceilings of this luxury living room is adorned with richly-stained brown wood ceiling trusses. This kind of treatment gives amazing character to otherwise plain-looking high ceilings. The dark wood floors match the feel of the trusses perfectly. The open plan to the kitchen really maximizes the available floor space of the area. Additionally, we also have a comfortable large sectional sofa, and a balcony area from the second floor in this space to really keep this room feel open and airy. Mediterranean themes, such as the one employed in this living room design example, bring in an unmatched rustic charm and sharp flare to any designed interior space. The concrete fireplace, the wood beam ceiling, and the honed travertine floors do their respective jobs amazingly well. The brick orange upholstery of the living room seating furniture set is also a good complement to the aesthetic of the room. 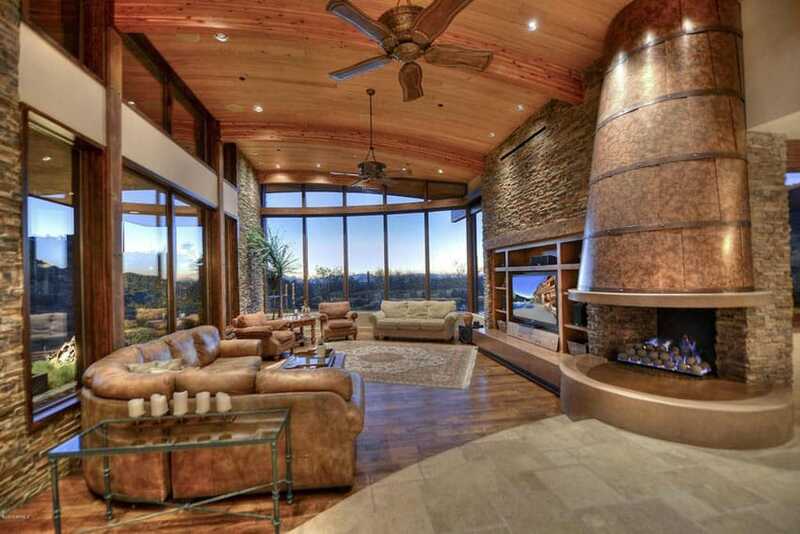 This luxury yet undeniably rustic example of a beautiful living room uses a unique curved ceiling design and a conic custom copper fireplace to make an inviting area. Curvilinear forms have always been known to be more welcoming and enticing than sharp linear edges. We can see this motif even on the soft edges and forms of the floor terminations and even the upholstered brown leather sectional sofa in the room. This beautiful living room has a hint of Mediterranean in its design. The high ceiling gives way to a foyer, making the space feel open and bright. The railings of the mezzanine as well as the grand staircase are intricately designed wrought-iron pieces. The double view doors on the first and second floor share the same design as the railings. 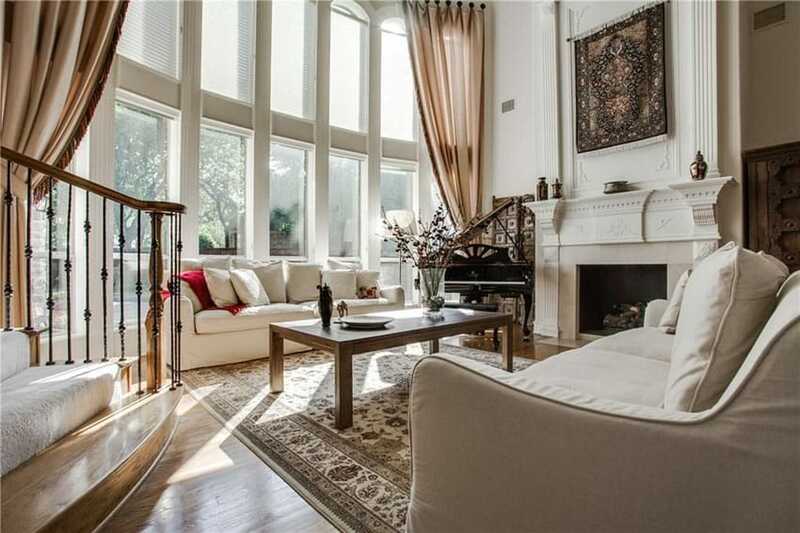 The welcoming living room space in the middle is quaint yet quite stylish. This amazing living room with a large open view opens up to a patio and an outdoor swimming pool area. 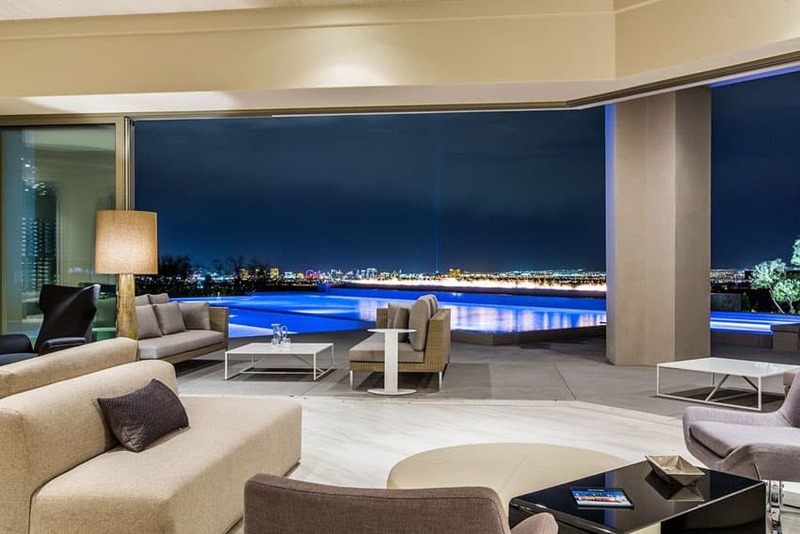 The city lights adorn the vista of this living room through its large openings. The sliding glass doors used, even when closed, lets you bask in the wonderful city-line views and evening sky. Living rooms rarely integrate nature as flawlessly as this. 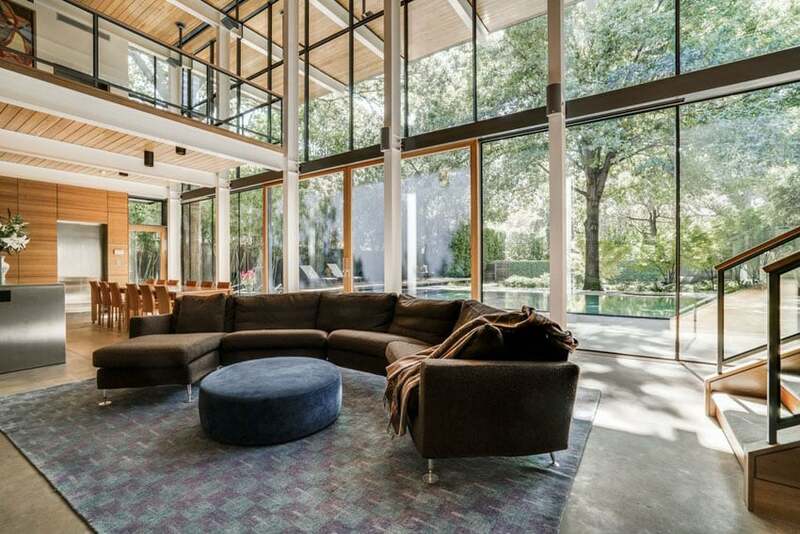 The wood flooring is one thing and the large glass view windows that showcase the landscaping outside is another, but the design feature here that really takes the cake is the custom chandelier. With its branches and leaves cleverly designed onto it, it really makes you feel as if you were in the outdoors. Art Deco designs exude an air of mysterious class and subtle and subdued charm. The dark color palette of this living room is pleasantly contrasted by the bright warm white tones of the contemporary grand chandeliers. The porcelain tile floor as well as shag rug are a polished shade of ebony, both really keeping the space grounded yet stylish. Another example of good Art Deco design, this living room uses color to brighten up the mood. Its pristine white arm chairs, sunflower yellow swivel arm chairs, and the subtle purple tones of the tufted leather seats in the back all blend together with the overall tone of the room. The numerous clerestory windows, glass view doors, and black polished porcelain tile floors are also nice additions to make the space feel even more open. This living room has a tinge of exotic Asian design styles in its aesthetic. The wood weave flooring employs an intricate diamond pattern that really sets the tone for the room. A beautiful patterned tapestry is displayed on the far end of the wall, next to the custom fireplace also adorned with jade horse sculptures. The furniture choices with the English sofa and camel back couch are subdued but also mysteriously bold in a way. The use of bright reds in the room also helped a lot in establishing its feel. This layout opens to the kitchen, keeping the space feel open and bright. To make it even brighter, a gratuitous amount of white is painted onto the walls and the box beam coffered ceiling. The upholstered modern sofas are a tinge of black to offset the bright whites in the area. The cream color sofas, area rug, and small portable home bar are great supplements to the beige walls and coffered and drop ceilings. The french view windows reveal amazing city skyline views that really give the space a contextually urban feel. This amazingly high ceiling is the result of freeing up space from the second floor to make way as vertical space for the living room on the first floor. This creates an undeniably luxurious open feel to the room and is supplemented even further by the addition of large view windows and flowing drapery. The modern rectangular fire pit in the center of the room adds even more to the high-end stylish feel. This kind of rustic arrangement really is the best in making one feel perfectly at home. 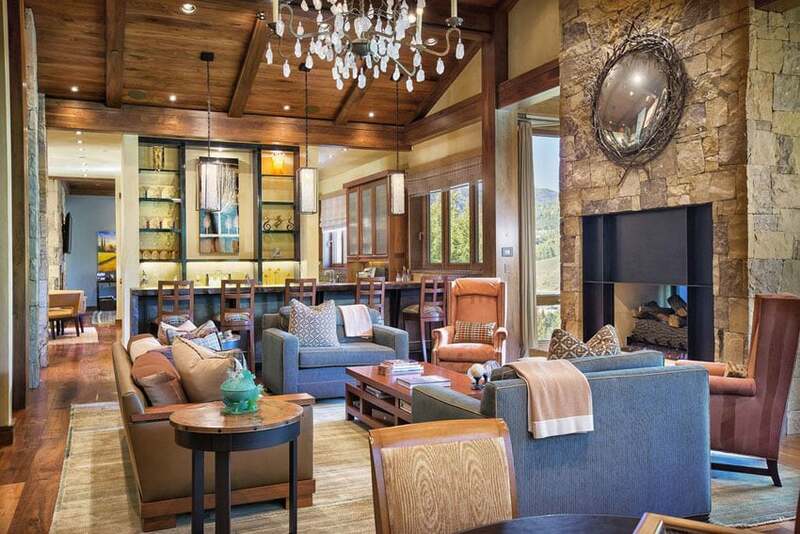 The coarse stone fireplace, the eclectic choice of brown and blue seating furniture, and the generous application of wood finishes really make this place feel uniquely comforting. 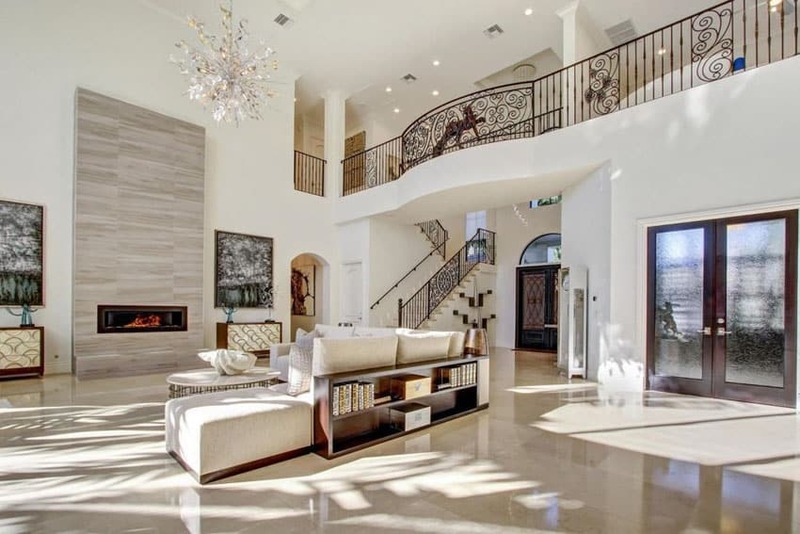 The select use of creative finishing touches such as the fireplace mounted wall decor and the contemporary chandelier are also smart design moves. Beautiful living rooms often have impressive views of the home’s landscape. 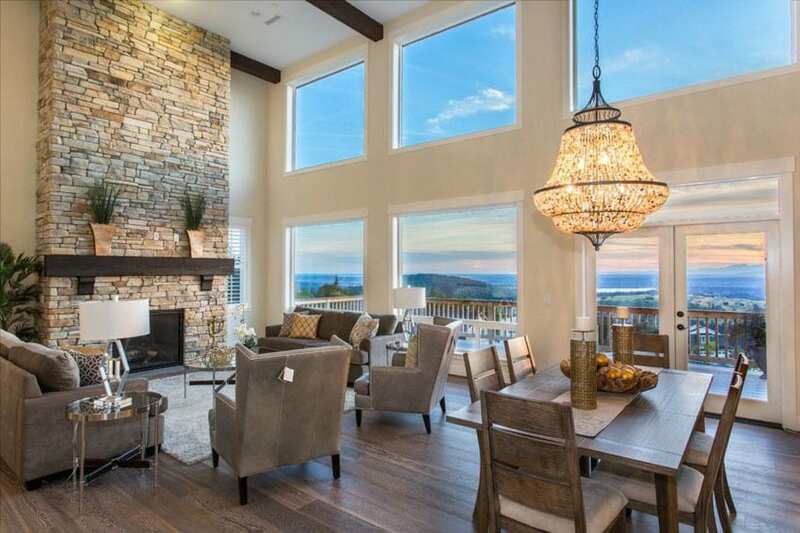 Nothing says comfort as well as amazing mountaintop views from the coziness of your living room. 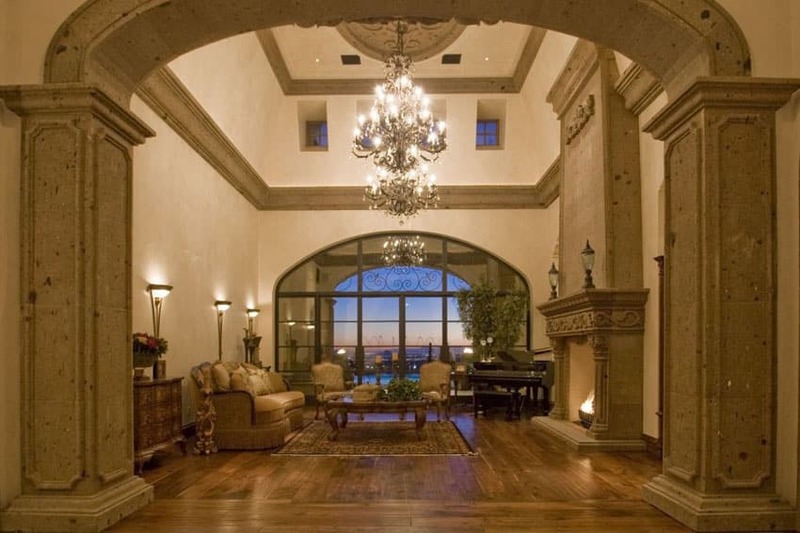 The large windows and view doors were specifically used to take advantage of the vistas. The open concept design also makes it so that you can enjoy the views through the large windows anywhere in the space. Muted navy tones were used as a motif for this contemporary living space. The high ceilings and mezzanine floor make the space feel large and open. The wide and tall windows exemplifies that even more. At the heart of the room, we have a focal fireplace that really brings the room together. 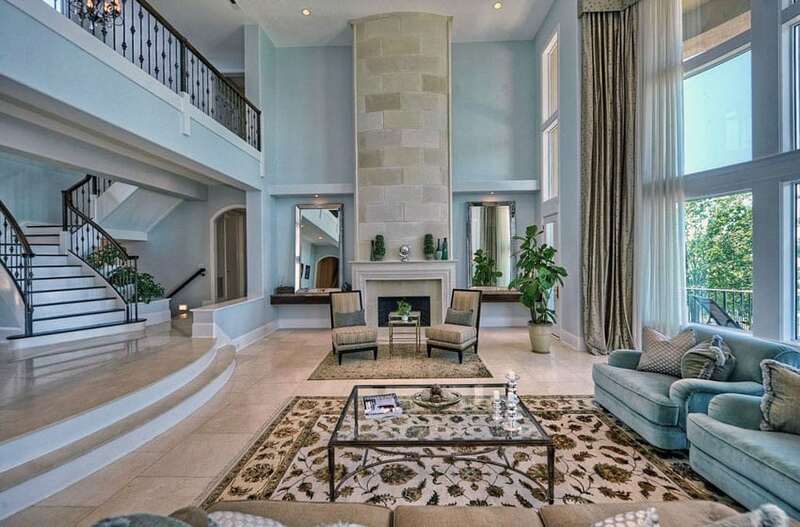 Beautiful living rooms with a formal style are a great place for entertaining guests. 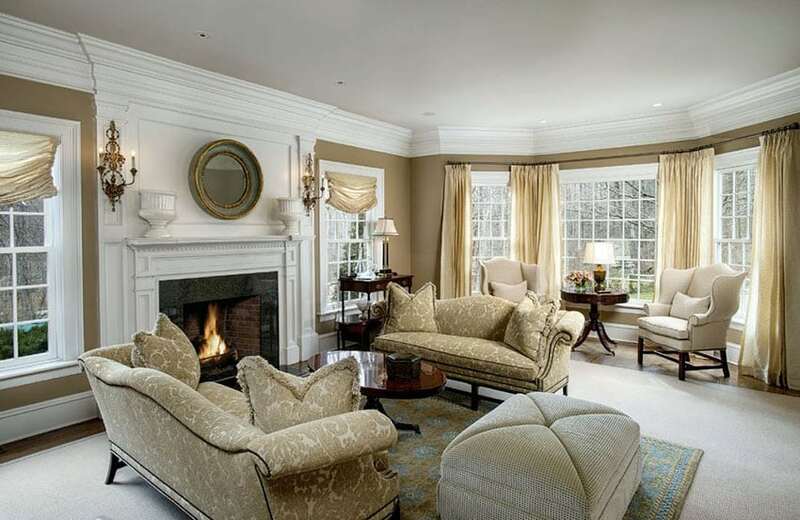 This formal living room has beige furniture in the form of camel back sofas, a tufted ottoman, and winged arm chairs. The fireplace has burning log fuel that really gives this space a charming traditional feel. The crown moldings and white trimmings are a nice touch. Finally, the bay window creates a small sitting space that one might use for more intimate or personal situations. This contemporary minimalist living room uses bold rectangular proportions and furniture to create a clean, sleek look. 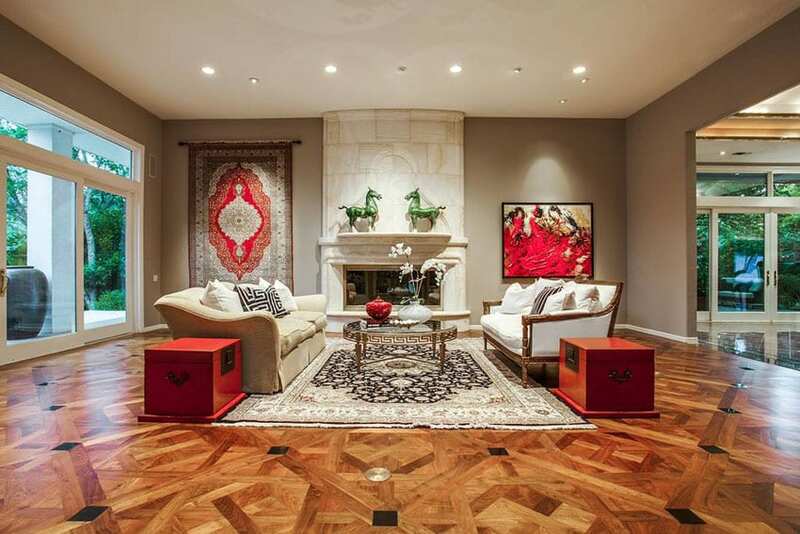 The wood parquet flooring is warm but has a geometric pattern that goes with the room’s aesthetic. The white painted walls and beam ceiling contributes to the clean vibe as well. As a coup de grâce, we also have amazing city views shown through sleek french view doors that lead to an outdoor balcony. The clean general spirit of this contemporary living room design is carried out by the matte white finishes of the walls and ceiling, as well as the clean beige marble tiles of the floor. The area rug used on the large sectional sofa seating area also grounds the space very well. The modern designs of the coffee tables are fit well with the aesthetic. On the outer wall, we have sliding glass doors that open up to the outdoor patio area next to the pool. 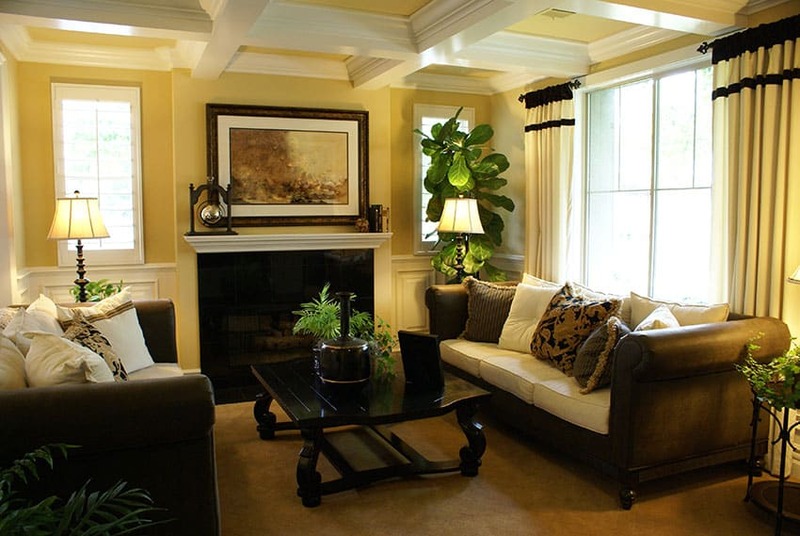 The modern ornamented style of this living room employs royal gold and hushed yellow color tones. The decors are works of art – sculptures and busts in gold and ivory. The lighted wall alcoves used focus lighting to highlight the floral arrangements displayed underneath them. The modern drum chandelier is also a good design piece. The use of wide glass windows lets a lot of bright natural light into the room. Beautiful living rooms that utilize large windows benefit from both natural light and bringing the vistas of the outdoors in. Since this living room has a lot of natural light it can use a generous amount darker colors. Rich brown wood can be seen on the coffee tables, side tables, and, most prominently, on the exposed beams of the coffered ceiling in the space. The browns are balanced out by the various light tones of the textured accent wall – which also has a gas fireplace – and the marble floor tiles. The open plan gives the room a chance to showcase its beautiful designer furniture as well. The geometric shapes, bold simple patterns, and red-blue-yellow color palette takes its inspiration from Mondrian artworks. The minimalist white leather seating furniture as well as the white painted walls and ceiling really help the more outspoken parts of the design to stand out. 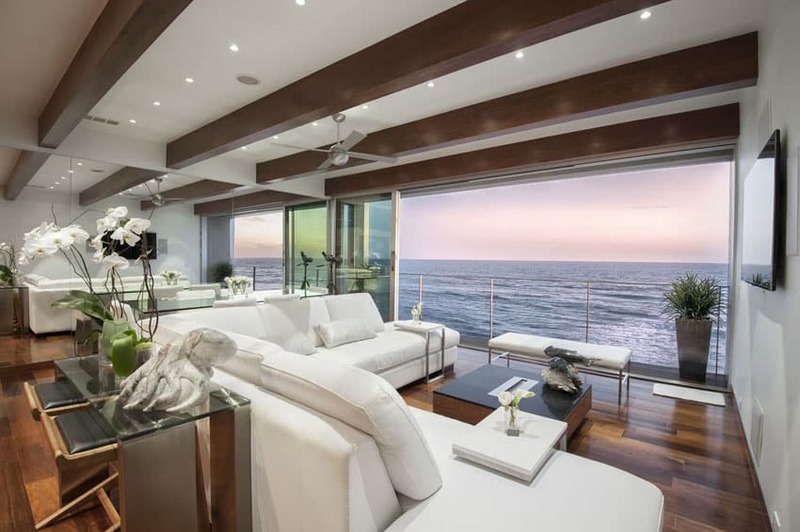 One the best parts of this design are the expansive ocean views seen through the large view windows on the outer walls of the space. This homey, rustic cottage style design is in a residence situated around lush greenery and forest trees which the aesthetic really matches. The wood board walls, white furniture, white and gray wooden coffee table and side tables, as well as the white wood main console are in light wood tones, while the floorboards are a darker, warmer shade. The french doors and windows give users amazing views of the backyard and the forest. The elegance of this design comes from its amazingly slender forms and proportions. The fireplace rests at the bottom of a detailed accent wall with subtle shelf-top and wall hung tapestry decorations. The high ceiling makes full use of the large view windows that really keep the room brightly-lit and open. Cream-color furniture matches the muted beige tones of the room. The classic piano serves as a recreational musical tool and as a stylish design addition to the space. Unique details adorn the gray walls of this formal living room. Saturated wide plank wood flooring keeps the color tones of the space grounded. The choice of using minimalist furniture – in the form of low-height lounge chair, a mid-century modern leather couch, and glass side tables – was a well-thought out one. This grand living room uses the imposing nature of large stone pillars to create a beautiful entry archway to the space. The high ceiling also uses stone crown moldings to line up the wall and give character to the vertical space. The most eye-catching design feature of this room has to be the grand chandelier – it lights up the room both functionally and aesthetically. The clean white living room uses a concrete finish accent wall to really give the space a unique rustic yet sleek look. The shag area rug’s white color offsets the deep brown of the wooden floor. The curtains drape over large windows that really let in light into the room. The sofa is a tufted modern leather couch also colored a pristine white and the reflective chrome coffee table is a good touch. 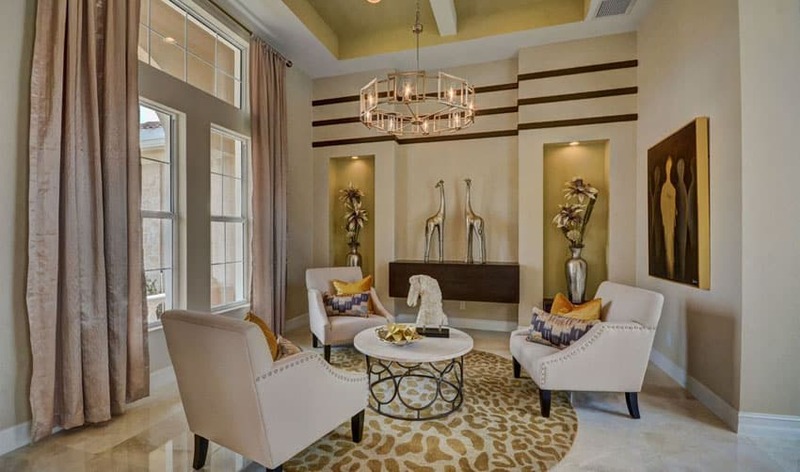 The simple yet striking design of the chandelier adds to the beauty of the designed space. This high-end contemporary take on the living room has exposed wooden ceiling beams that slope up, culminating in a high center where an artful sphere chandelier hangs. The white paneled walls give it a traditionally stylish vibe while the colorful hung artworks give the room a nice splash of color. The two black leather Chesterfields are impeccably classy, and coupled with the brown leather armchairs, and dark stained solid wood coffee table, really help define the charm of the room. Glass view doors show the amazing views of the landscaping outside this living room. The white furniture are clean and sleek minimal pieces, and the hickory wood floor go well with the entertainment wall finish as well as the wood coffee table in the center of it all. The high tray ceiling has crown molding and a ceiling fan in the center. This quaint and lovely example of welcoming living room design has a light blue box ceiling with a modern chandelier hanging over the main lounge space. The wood flooring adds warmth to the area, and the minimalist loveseat sofas make for good subtle accent pieces to the room. The open door to the outdoors also lets much appreciate brightness and openness to the area. This luxury space is chock full with good design pieces. At the far end of the room, we have a Hampton design fireplace. The intricate design of the chandelier is another eye-catching feature of this white living room space. The Louis XIV armchairs, camel back sofas, and glass top coffee tables are all good furniture for the room. The white french doors let nice views of the backyard into the space as well. The spoke wood beam ceiling is the center point and basis for the curvilinear design seen in this living room layout. The luxury aesthetic is seen in the stone veneer accent wall, polished marble floor tiles, and just largeness and openness of the space. 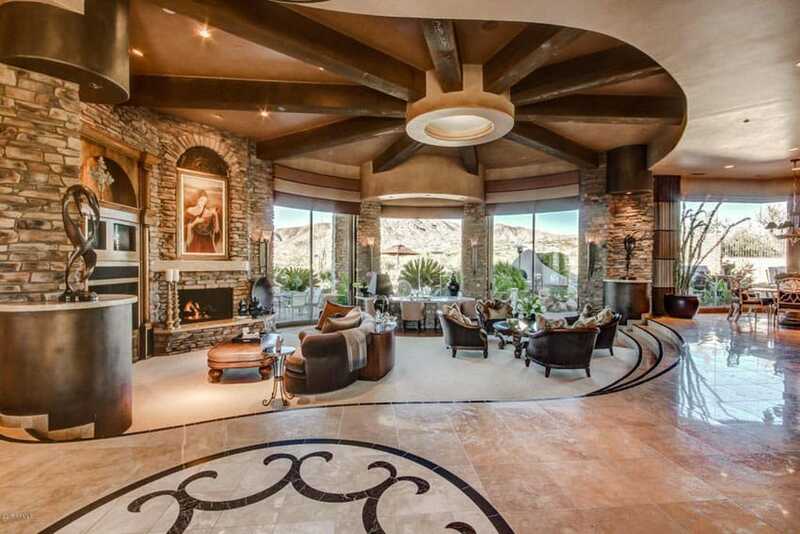 Views of the desert mountains can also be seen through the clear glass view windows lining the outer wall of the room. 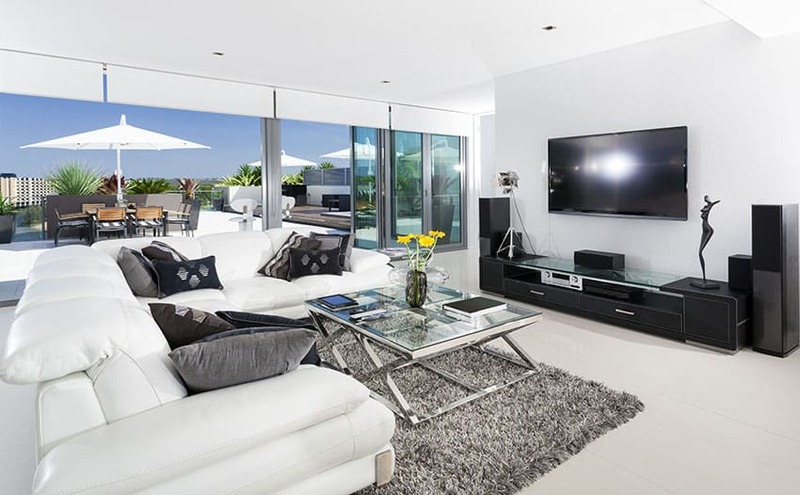 This clean white living room offers a large white leather sectional sofa that is contrasted by a black entertainment center and wall mounted television. A shag area rug with a silver and glass coffee table add to the comfortable and casual feel of the space. The open concept layout flows from the living space out on to the rooftop patio where guests can enjoy full indoor-outdoor living. This modern industrial style of design uses raw exposed design choices to create a beautiful, unpretentious space. The main elements used here are steel, glass, wood, and concrete. We have the exposed steel structural elements – the columns and beams holding up the house. The floor-to-ceiling glass view windows and sliding doors give a breath-taking view of the outside greenery and landscape as well lets copious amounts of natural daylight in. The wood boards used on the walls, door leafs, and the ceiling really give some nice pops of warmth and color. 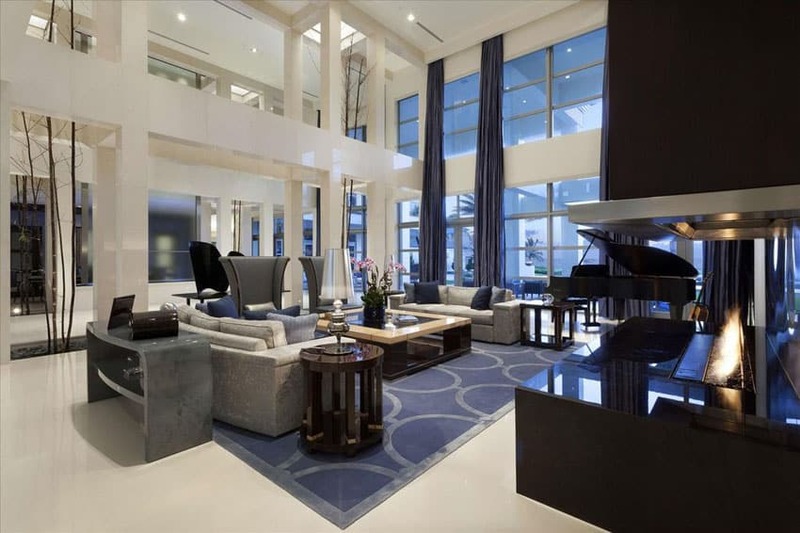 Clean and beautiful are the two words one would use to describe this modern living room design. The white marble panel fireplace goes well with polished porcelain tile flooring. 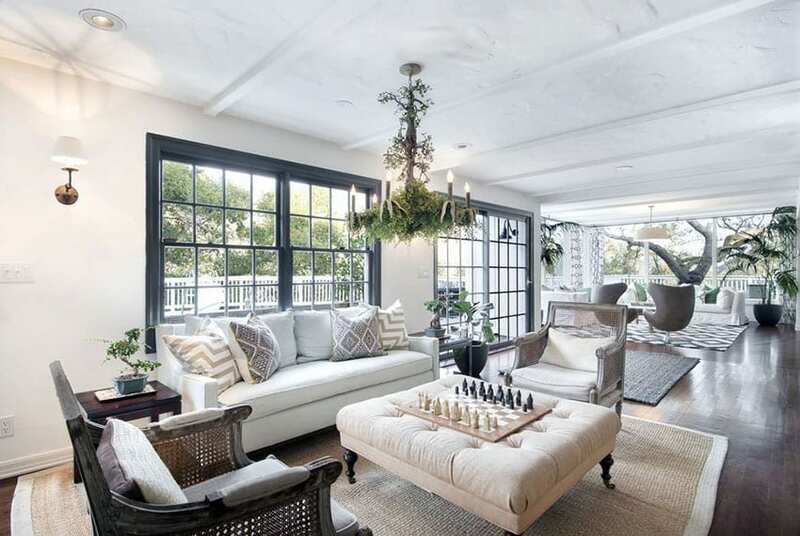 The clean forms and appearances of the doors, coffee tables, and even the white leather Lawson-style sofa match the overall theme of the room. 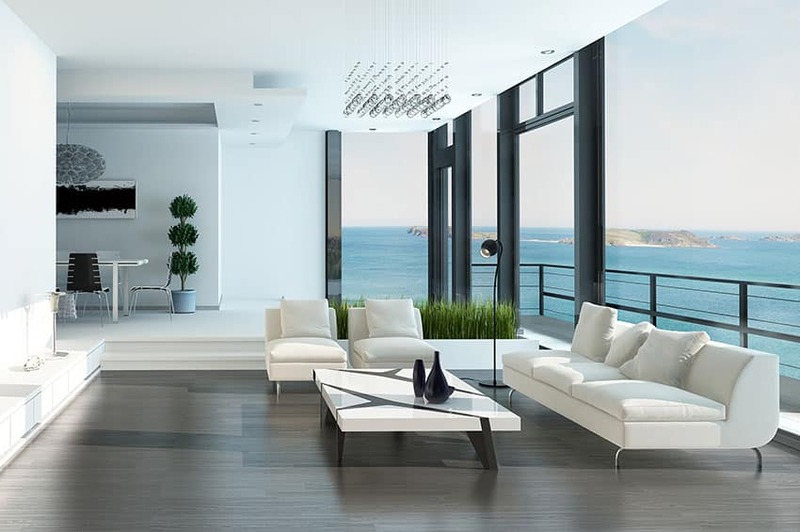 The corner bay layout of this modern seaside living room design takes advantage of the expansive oceanfront views by using large view windows. The curvilinear sectional couch is a bold move but one that paid off by making the space feel creative and alive. The contemporary designer glass coffee table and metal sculptures really make the room have personality. This traditional second-floor living room design has a unique vaulted ceiling that has its center point the highest point of the ceiling as well. Hanging from that center point is a glass box chandelier. All around the room, we have french doors that show lush greenery outside. The stone floor tiles go well with the light-colored leather seating furniture shown all around the room. 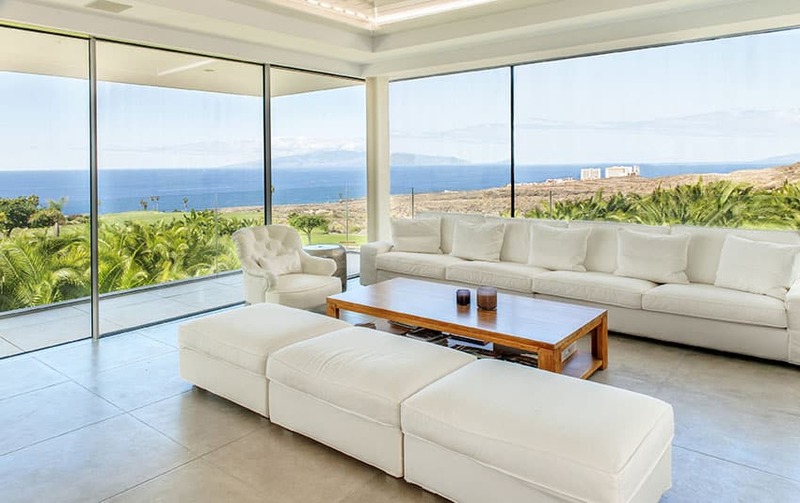 The million-dollar ocean views seen in this tropical style open living room design are truly one of a kind. The architecture of the space uses dark brown wood columns, arches, and ceiling boards. The floor is a nice dark shade of auburn as well. The white Lawson style leather sofas have a brightness that offsets the browns of the space. This beautiful living room has a mostly light colored palette. This can be seen in its polished marble floors, light bright blue painted walls, tufted leather armchairs and cabriole. The large and spherical designs of the chandeliers, floor lamp, and coffee tables are prominent and bold. The use of numerous french windows keep the room bright and open as well as give the walls good amounts of character. 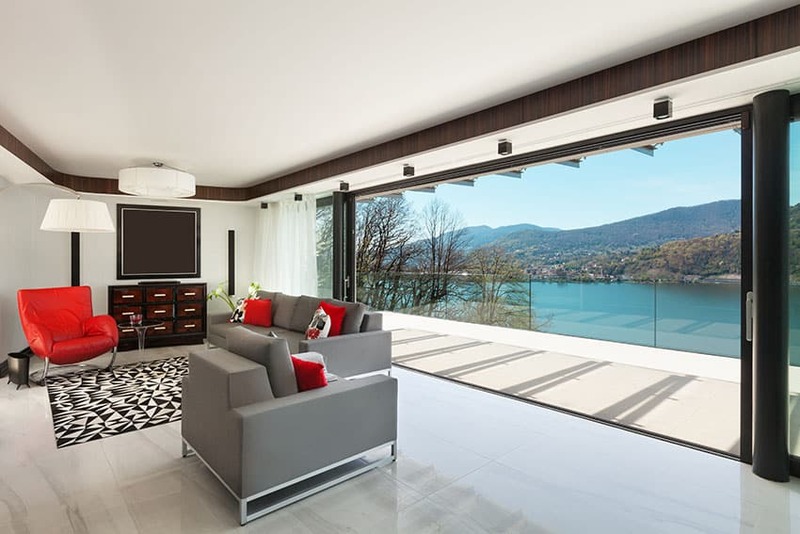 This minimalist modern living room has a large open wall that opens up to amazing lake views and mountainside views. The splashes of muted color in grey and passionate pops of red are exemplary examples of smart design. The polished marble floors, tray ceilings, and dark brown wood trimmings are also nice touches. This peculiar proportion – narrow walls and high ceiling – is employed to give rooms peculiar charm as well as serving as a passive cooling design mechanism. 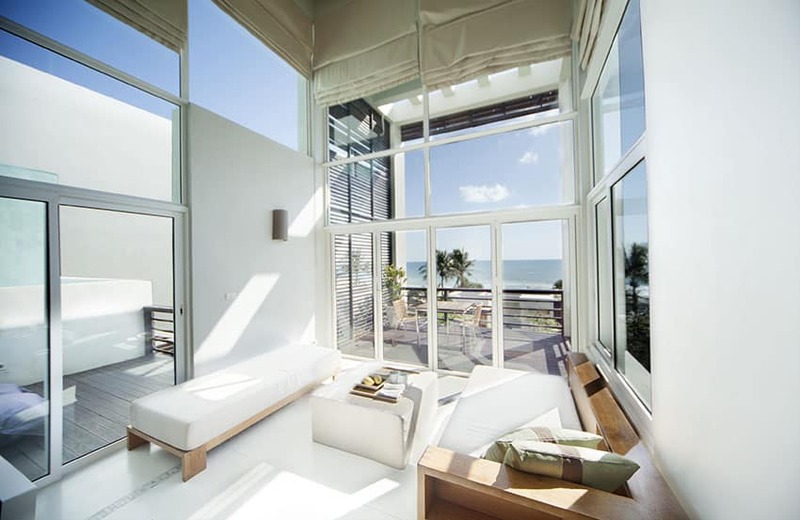 The floor-to-ceiling glass windows are good for inviting in light and letting users bask in the amazing ocean views, but solar thermal gain might be an issue. The high ceiling serves to alleviate that problem. Aside from that, the clean wood and leather furniture is a clean and quaint design choice for the area. We also have view doors that open up to an outdoor patio. Simple and modern – the living room uses cream arm-less Lawson-style low sofas, brown barrel chairs, and chrome circular coffee tables. 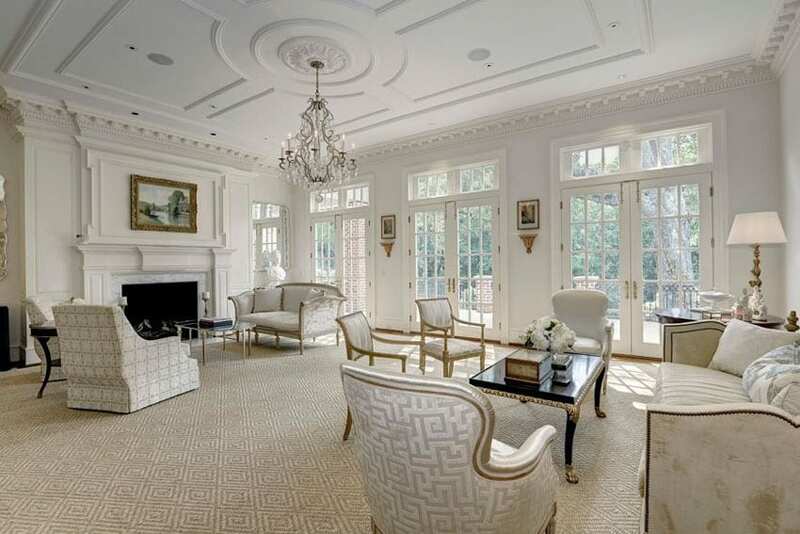 It has pearl white floors, walls, and ceiling finishes. The flowing drapery covers large glass windows that make the room even brighter. 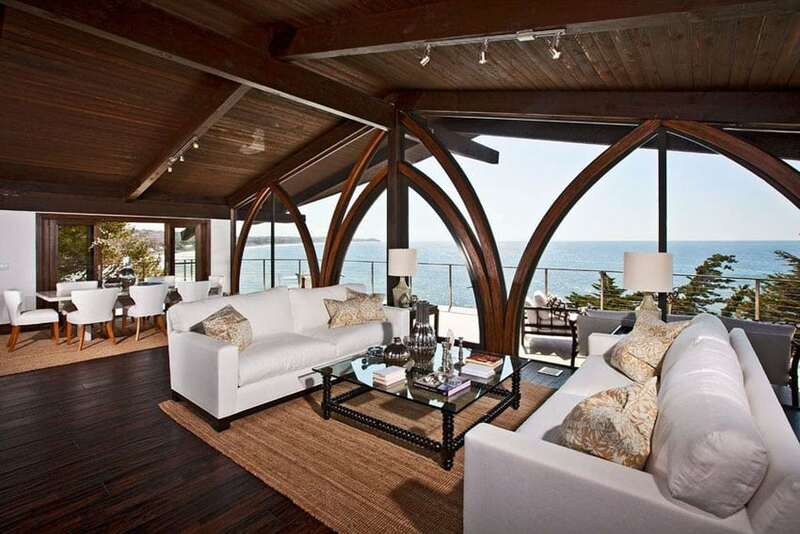 Beautiful ocean views seen through the large glass windows adorn this seaside modern living room design. The dark wood floors in the conversation pit style layout contrast the white floors in the rest of the space. Modern hung ceiling decor adorns the high ceiling. 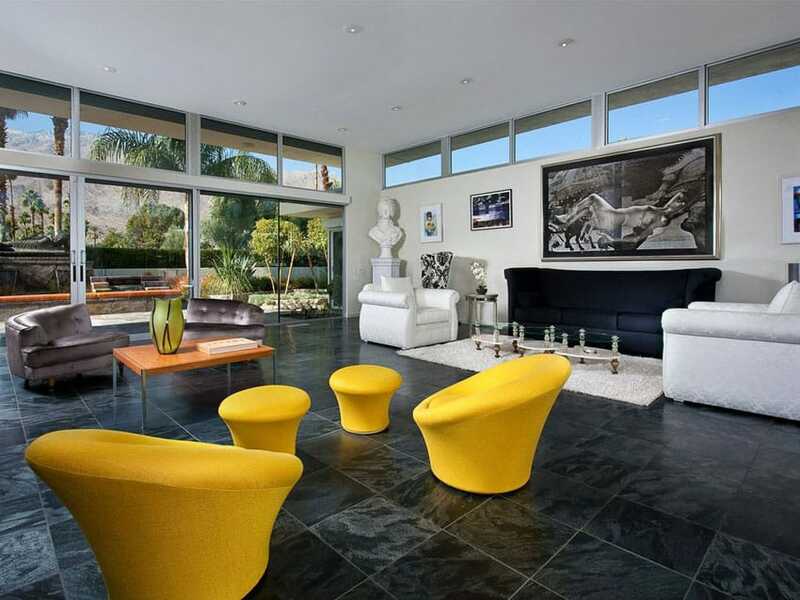 Mid-century modern white lounge chairs and sofa match with the sleek design of the coffee table. This decorated living room has a bright sunny feel to it thanks to the generous amounts of yellow tones seen on the walls, draperies, and raised parts of the coffered box ceiling. Elsewhere, we have white trimmings seen in the ceiling beams, wainscot, and window frames. The large brown leather couches have white seat cushions as well as differently colored throw pillows – this makes the space feel personalized and welcoming. 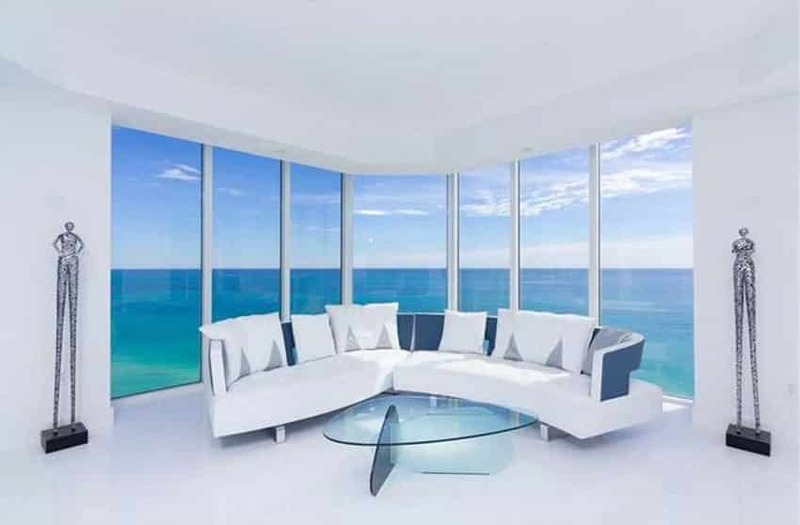 The gorgeous tropical ocean view is seen through large, wrap-around floor-to-ceiling windows. The unusually lengthy white seating furniture as well as the nicely placed white tufted leather arm chair give this room ample seating space. 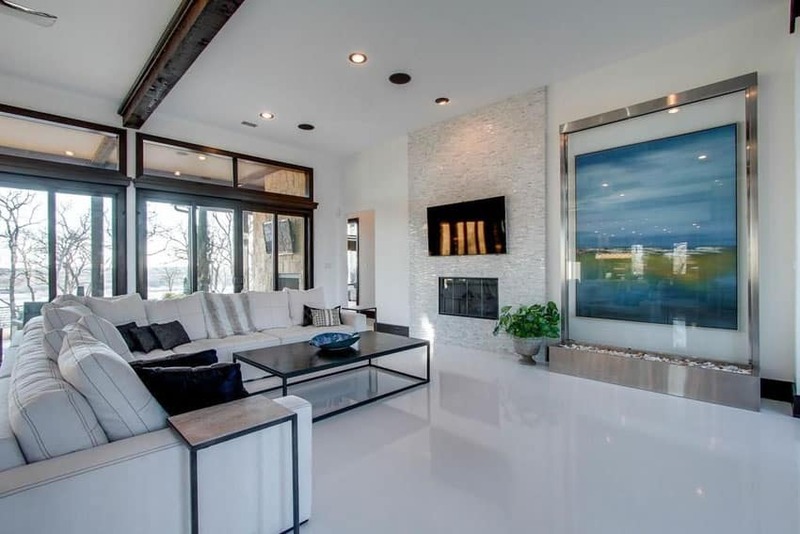 The travertine floor tiles keep to the white and bright theme of the room. Finally, the warm brown cherry wood coffee table serves as the only splash of warm color in the room and serves as a focal point of sorts. The elegant placement of the minimalist low-height bookshelf, sectional couch, and circular marble top coffee table is done so as not to to undermine the openness of the space brought about by the expansive floor area and the high-ceiling. The modern fireplace and accent wall centralizes the area while the contemporary chandelier used adds some flare. The wrought-iron railings are also nice touches.